When I finished making my Monkey Socks I still had some yarn left. I loved the yarn so much that I had to make something else. There wasn't enough for another pair of socks so guess what I decided to make? Can you guess? Huh?! You guessed it - a hat! I know, it was time to try something different. I thought about trying to come up with a monkey hat pattern but didn't quite feel I could pull that off and thought it might pucker a bit. 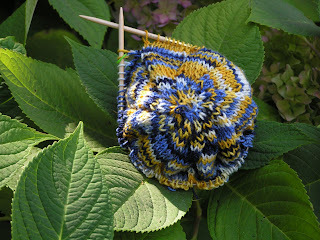 So I went with the ole stand by - my favorite pattern - the swirl hat. The yarn is Loopy Legends "Janice's Sunshine in Winter." Named after my friend Janice, I just had to give it a try and have not been disappointed. Like her, it is bright and sunny. When I visit her blog I always want to go visit her! She has a wonderful, loving family and everyone always seems to have so much fun. I've never been to Iowa but if I ever do - I'm showing up on her doorstep! I was also delighted to receive an "I Love Your Blog" award from Marie. THANK YOU Marie not only for the award but for all your nice comments both on this blog and on my photo blog! I've actually taken a bit of a hiatus from the photo blog because I think Marie and my Mom are the only people who ever look at it! Marie has started writing her blog in French so I'm not entirely sure what she says about this award but I've gotten the basic idea. Jennifer - is my good buddy from one of the International Totel Exchanges. 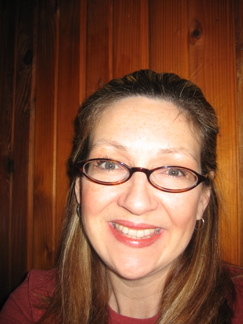 I was so lucky to get to meet her when I went to Boston and we have become very close over e-mail. I love all her knitting and her fearless nature to take on something new. Check out her latest beach photos and all the adorable little hats she has been making for the Innocent Big Knit. Janice - as I mentioned above it is just a delight to visit her blog, see her "old" dog Sumo and her young puppy Sophie. She is always making something interesting, cooking something yummy and entertaining family and friends. Marie - is just amazing. Check out all of her fabulous cable scarf patterns and dish rag patterns. I can't even finish my Irish Hiking Scarf and she's off designing these scarfs where each one is more amazing than the last! Deb - I have never met Deb but her comments are always so nice and I can just tell that she is an incredibly warm person. She is often one of the first to leave me a comment and when you visit her blog she had dozens of them! Lisa - is always making some intricate project like a sweater and gives us all a glimpse in to what's going on in Alaska. I love all her nature photos. Go on over to her blog and take an exhausting "hike" in her latest post! Bonnie - is one of my first buddies from the knitting blogoshpere and my co-host when we did the International Tote Exchange. Bonnie has been in a bit of a knitting rut lately but she is always sewing something amazing. She does it so quickly too! And check out her yummy recipies even with their own blog! Kristen - is a relatively new knitting friend from exchanging as well! She has three kids and always something exciting going on. She's been going through a tough time lately and I'm thinking of her. Please send good thoughts her way. Wendy - is my downstream pal in SP12. I just revealed myself to her so now I can talk about it. I've been enjoying getting to know her anonomously and it will be even more fun now that she knows who I am! She's sick right now so go on over and leave her a comment to feel better. I can't wait to see who everyone else picks! Thanks for the nod to the blog. I'll post it later today. By the way, I've somehow lost your 'real' email. Can you send it to me again? Thanks so much for the award :-) And I do so hope that I find you standing on my doorstep someday!!!! Love the hat made with the yarn. 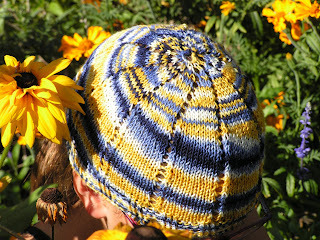 Now I think I need to order another skein so I can have a hat too!! Love the hat you made for Janice - it knit up beautifully! 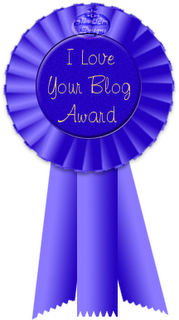 thanks for the blog award. you're too sweet. and love that blue/gold hat. perfect UofM colors for my DH (University of Michigan). Ooh very pretty hat! And what a great way to use up the extra yarn!